Sam Osborne is the longest-running franchisee in the Tropical Smoothie Cafe system. That says a lot about him, as well as the brand. He's been a part of the smoothie chain for nearly two decades, as both an operator and an area developer in Florida. He still loves every day, has added a new concept, and plans to expand further this year. When we interviewed Osborne 8 years ago (Q1 2009), he was a 36-year-old operator who had latched on to a growing concept called Tropical Smoothie Cafe. The Tallahassee-based franchisee also owned the area developer rights to the Gainesville and Orlando territories, overseeing 22 stores and operating two units himself. This was just as the Great Recession began wreaking havoc, especially in Florida. When funding got tight, says Osborne, he simply hunkered down to weather the storm. Since then, he's closed two under-performing units that were in non-traditional locations, took on two transfers, and added a unit, bringing his total to 23 today. "Financing is finally opening back up now and we are in the middle of expansion plans," he says. One way he's expanding is by teaming up with an emerging concept, Island Wing Company. The new brand, with just 5 locations open in Florida, is a family sports bar offering baked wings--no grease and no fryers to deal with. "My one location has been open for about 6 months now in Tallahassee, and we expect to do $4 million to $5 million this year." Stretching out from years as a QSR operation to a full-service restaurant has been a challenge, he says. "You only have a dozen or so employees in QSR, but it takes several dozen in a restaurant." Still, things are working out just fine for Osborne, who has beefed up his infrastructure since we last spoke. "I hired a regional director of operations about five years ago, and that has freed me up to do more of the big picture thinking and planning to chart growth," he says. Osborne expects to add four more Tropical Smoothie Cafes to his operation in 2017, and perhaps one more Island Wing Company. At 44, he says he has a lot of franchising left in him. Company: Tropical Smoothie Cafe/Tropical Smoothie Area Development/Island Wing Co. Working for my dad's construction company during my high school years. Going into the Air Force in 1990 and going to Desert Storm. It gave me a perspective about being an American that not everyone gets a chance to see and appreciate. As for influences, I am a big believer in you are who you hang out with. I have been blessed to have been around people who are smart, hard-working, ethical people, and those are the ones I use to guide my own day-to-day decision-making ideas. When I first got into Tropical Smoothie Cafe I had a vision of just opening up one or two locations, and that would be it. I ended up opening up four within 2 years and becoming an area developer for the franchise, helping others open stores in different parts of Florida. 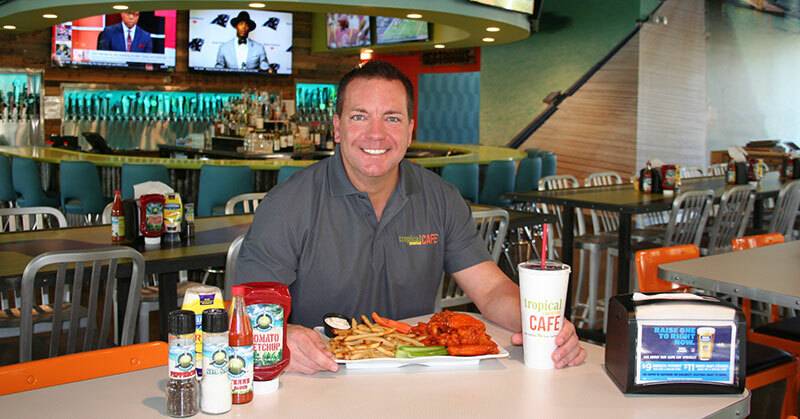 Most recently, I partnered with the original founder of TSC to open a franchised location of his newest concept, Island Wing Company, here in Tallahassee. Opening a new full-service restaurant/bar has been a great reminder of how important it is to put all the pieces in place and to get and keep the best people in key positions. Hiring personnel is always the biggest challenge, but when the pieces are in place it allows me to focus better on the long-range goals. I would like to reach a total of 50 Tropical Smoothie Cafe units in my area development business. That is my long-range goal. TSC has been exploding over the past few years and that number is looking very achievable. I always look back to my mistakes or "losses." Those are the turning points that make me a better business person. I have said it many times: I have never learned as much from my successes as I do from my failures. I have an ability to find the silver lining to just about any bad situation and use it to my advantage. This allows me to truly have very few regrets in life. Hands down, getting involved in Tropical Smoothie Cafe when it was an unknown and there were doubters around me wondering why I would want to take such a risk. I am their oldest franchisee in the system. Not fully understanding the real estate processes early on and what it takes to make a successful store work. Location, location, location is so important. When you have a great concept all you have to do is find good real estate and it will really do well. With so much growth going on right now in TSC and with the newness of IWC there is no a longer a "typical work week." I find myself working harder than ever, including nights and weekends, but it's fun and exciting. I've never been so optimistic about where things are going. I converted my garage into a hybrid gym and typically do P90X or Insanity five or six days a week. Right now I am training for a marathon, so most of my focus is running four days a week with one to two strength training days. I used to cling to a saying that I learned early in my career where someone told me, "Employees will never live up to your level of expectations, but only your level of acceptance." I still think about that often as it reminds me about how to manage people. But now, with all the things I have gone through and worked hard to get, there is another saying that constantly stays in the forefront of my head, especially when things get tough. I was told, "Once you set your eyes on a goal you don't ever look back. You run as hard and as fast as you can to get to it. There will be obstacles along the way that may turn back most folks, but you keep your eye on that goal and when you run into that obstacle you go over it, you go around it, or you bust right through it." I love variety. I enjoy that fact that I may have a few hours of office work, a couple of meetings, site selection for a new store, or talking about upcoming promos or operation procedures all in the course of just one day. I never feel like I am strapped to the same routine every day. I have been able to have a job that completely fits me. I used to really struggle in this department. I would be on vacations and end up working. Over the past several years I have become very vocal that when I am at work I am there to get things done, and on the flip side when I am on vacation or spending time with my family or friends I don't want talk about work or get distracted. This doesn't mean that I don't work at night or on weekends, just that when I have decided it is time to "punch out" I want to give my undivided time and attention to my family or friends. This one is easy. I am a pilot and still own a plane but don't fly it much because not more than a couple of people can fit in it with me. A couple of years ago we bought a new boat. I love getting lots of friends together, and we go out on it during the warmer months and hang out together. What used to be my favorite thing to do is no longer because I really enjoy time with friends and family out on the water. Because my mind is always so active, I don't usually sit down to read much--it just isn't that relaxing to me like it is to most people. But I have read many books and most of them are either business-related or motivational. One of my all-time favorites is a book about Charlie Plumb, who was a POW in Vietnam for 6 years. It's called I'm No Hero and it is very inspiring. "Forrest Gump!" There is no better movie that can take you from laughing to crying to being inspired to be a good person like that movie does. I'm a pretty open book kind of guy, so I don't think there is anything about me that would surprise anyone. Somehow years ago someone gave me the nickname "GSD." It means Get S--t Done. I have always held myself accountable to always do whatever it is that I said I would do and not make any excuses. I tend to remind others around me that if you say you're going to do something then stick to it and GSD. It can bother me sometimes when people don't. When I was in the Air Force I had strong aspirations to become a military pilot. Little did I know there was this entrepreneur bug lodged inside my brain that told me I didn't want to go about my career and be able to forecast out how much money I would be able to make or be limited to by depending on rank and years and service. I wanted to really have a mentality that "the sky is the limit." That said, a huge part of what made me today was those 4 years of service. I wouldn't trade a single day or experience I had during that time. Five-day vacation on the Harbor in Destin, Florida, with Christine and the three kids. One of my favorite books was about Charlie Plumb, the Vietnam vet. I was extremely fortunate to have had breakfast with him many years ago when he spoke with our franchisees. We hit it off that morning since we had something very small in common: he ejected out of an F-4 fighter on the day he was captured and I worked on the ejection seats for the F-4 fighter for 4 years. To say he was inspiring would be an understatement. He gave me some of the best business advice I ever received and I still think about him and his speech all the time. I would love to have another opportunity to sit down with him and have lunch. "Do the right thing." Karma isn't just about personal dealings. Hire the best, give them the tools to be successful, and then give them guidelines on what the expectations will be. I have never been a micro-manager so I have to rely on having the right people around me. Finding the right people to work for me. Employees are some of the best aspects of owning your own business, but getting all the pieces of the puzzle to fit can be tough sometimes. Sometimes a goofball and sometimes a relentless boss. Be a better listener sometimes. I have a weekly meeting with my top managers. During that meeting I cover usually six to nine areas of the business and we review and refine what the expectations are going to be. At the end of every meeting I always ask, "What do you need from me to reach our goals?" I like to set the expectations but then leave it up to them to find ways to achieve them. I am a systems guy. I like to get into the back of the house and see how it is being done and then go back and create systems that will help us do it better and give us better reporting and clarity into what it's doing for our business. My value is not standing in the kitchen or at the register and I know that. I enjoy doing it from time to time, but I know that if we are going to grow, then my area of expertise is helping my team come up with ways to make their job more productive. Buying power and systems. As much as I like to create my own systems I love having systems in place for me that we can use day to day. I have been lucky to be in two really good concepts that do those things well. When we really got hit hard in the Great Recession I learned that grassroots marketing is extremely powerful. It takes a lot more time and ingenuity to execute, but the results far outlast any mainstream media marketing that we all get so accustomed to. I also found that teaming up with local charities can be very beneficial as well. This has become a double-edged sword. We can instantly get our message out to customers, but you have to be careful that you don't say or do things that will upset them, as they have an avenue to say negative things about you that others may read and assume are correct. I am a huge believer in doing group interviews and doing them on a regular biweekly basis. I also believe that when a potential employee comes in asking ,"Are you hiring?" you always say "Yes!" Even if you don't specifically have a slot open there will always be that candidate who stands out, and you know that you have to find a place for them even if it means cutting one of your weak employees. We call it Topgrading, and it allows us to hire slowly and fire quickly. Most managers do it the opposite way. As a franchise, one of the nicest things to have is our organizational services department. They are constantly upgrading training techniques and developing new ways to get all the crew members on the same page together and more quickly. I believe in the old adage that we should always get rid of the bad apples. Employee morale can have far-reaching implications both good and bad. If you don't get the bad ones out of there soon enough, then all you will be left with are the bad ones. I heard a speaker years ago say, "It's not that difficult to achieve goals. Just always do what you said you would do, how you said you would do it, and when you said you would do it." I tell my staff that I expect the same things out of them that they can expect out of me, and if we can just stick to that simple philosophy stated above then most of the time we will succeed. We are finalizing three leases in TSC right now, with another one just starting the process. I hope to have three stores opened by Q2 with a fourth opened by Q3. I feel pretty confident we can get another two franchise agreements signed by year-end as well. I like to always stay ahead of the curve. The QSR industry is doing pretty well right now, and I would like to try to stay ahead of the industry's comp sales by at least 2 to 3 points. In a new family restaurant/bar like Island Wing Company we haven't been able to track year-over-year results yet. I am hoping that when we hit our 1-year anniversary in July that we can see a 10 percent growth in the next year. My goal is to have at least 10 to 15 additional Tropical Smoothie Cafes opened within 5 years and possibly one more Island Wing Company. In 10 years I would like us to have hit that 50-store mark in TSC and possibly be doing some different things in IWC, while at the same time branching out to some other, different investments or business ventures. We are riding a really nice wave right now and have been for the last 4 years. We have seen double-digit growth in sales year after year. As for our employees, it has become much more competitive to find good candidates because the job market has opened back up again. We have to really work hard on "casting the biggest net" to find new potential candidates. It's great to see our customers all happy again. Florida got hit pretty hard about 10 years ago and it took a while for our region to bounce back. There were a lot of sad stories about folks losing their jobs or commissions and that seems to have really turned back around. It is hard to grow when financing dries up. Banks are now working with us again to do new stores or improve old ones. Six or seven years ago it was almost impossible to get money for a restaurant. I just completed a new loan with a local bank in Tallahassee where they are giving us 100 percent financing to move our store to a new location. With Tropical Smoothie Cafe we sit down at the end of each year and take a look at three factors: 1) How is the QSR industry doing in comp sales trends? ; 2) How is TSC doing in comp sales trends? ; and 3) What things do we think the coming year will have in store for us? This helps us make a conservative estimate as to where we think we will line up. Forecasting isn't just about where we think our bottom line will end up with regard to profits. We also have to create local advertising budgets well in advance so we can line up all our marketing strategies for the year. I have always liked working with local or regional banks. A lot of times it's not just about whether the business plan makes sense for a bank to decide whether or not to make a loan. It's about the person. Getting to know the people who run the banks is so important in establishing trust. They are making an investment into the person just as much as they are the company. I have always been a believer in giving them opportunities to move up and to make bonuses if we hit our goals. In both my concepts we have different ways to incentivize them. This is one of those things that quite frankly it is just too much to try to pay out without increasing menu costs to the customer. It's a fact of life that when costs go up there is a fine line where the company can and cannot absorb those costs from the net profits. There are so many new costs out there right now that unfortunately the only way to stay in business is to increase pricing. I have always paid my employees more than most of my competitors. That said, I also expect the best out of them. We have to get and keep the best to perform at the highest level. At 44, having an exit strategy just doesn't even sound right. I make jokes all the time that I haven't decided quite yet what I want to do when I grow up. I do know that 15 years from now I want to be doing a lot more traveling and working less often. I don't know exactly how that may work out, but in a perfect world I see myself bringing on some additional staff who would run more of the day-to-day stuff that I still work on right now, and then having the flexibility to step back and enjoy more personal time with family.